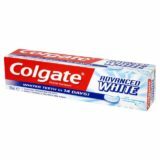 Colgate Whitening Advanced Toothpaste, moves from the realm of oral hygiene into beauty product with its promise to whiten teeth to beautiful Hollywood standards. The toothpaste contains tiny flecks of mica which work to deep clean the teeth, removing plaque, tartar and loosening stains caused by things like wine, coffee and so on. Colgate promises that this toothpaste will strengthen tooth enamel, provide anti-bacterial protection (and therefore fresh breath) for up to twelve hours, and protect against staining, cavities, enamel erosion, gum problems and sensitivity. Implicit in the word ‘whitening’ is the promise to whiten teeth that are yellowing or otherwise stained. One of our colleagues, a recent ex-smoker, leapt at the chance to try out this toothpaste. Her teeth are healthy enough, just rather yellowed from nicotine and coffee consumption. She used the toothpaste twice a day: first thing in the morning and last thing at night, trying to leave at least half an hour between brushing in the morning and eating her breakfast. Oral Health Improvements: Our colleague’s gums looked healthier within a week, she said, a lovely pink, rather than the rather unpleasant ‘greyish-pink’ that she was used to. This may be due to her having given up smoking which can impact on circulation, but our colleague felt the change was too closely aligned to her use of the Colgate Total Advanced Whitening Toothpaste to dismiss the results out of hand. While her nicotine staining is still there, the toothpaste’s mica flecks have done some work towards lightening the staining. Distressingly for our tester, she has a small crack on one of her incisors, which is now more visible as the surrounding enamel is noticeably lighter than the crack into which the staining has been able to sink more deeply. Despite the slight sensitivity – which our tester is happy to attribute to the greater cleaning that her teeth have undergone – the overall rating is a high one.